How can one try to classify a man like Tolstoy? – Russian writer, aesthetic philosopher, moralist and mystic might be a mere beginning. Born into a wealthy landed family, he was educated privately and at Kazan University, where he read law and oriental languages, but did not graduate. His early life was dissolute until, in 1851, he joined an artillery regiment in the Caucasus and there began a literary career. Commissioned at the outbreak of the Crimean War (1854), he commanded a battery during the defence of Sebastopol. When he left the army after the war, he was fêted by the literary circle in St. Petersburg (1856), travelled abroad, visiting Britain, and in 1862 married Sophie Andreyevna Behrs who bore him 13 children. He settled on his Volga estate and combined the duties of a progressive landlord with the 6 years of literary toils which produced the first of a long list of literary masterpieces, War and Peace (1863-1869), considered by many to be the greatest novel ever written. At the same time as being a domestic tale which explores the fortunes of two notable families, it is a national epic of Russia’s struggle, defeat and victory over Napoleon. The proud, shy, duty-conscious Prince Andrew and the direct, friendly pleasure-loving but introspective, morally questing Pierre reflect the dualism in Tolstoy’s own character. Tolstoy fearlessly attacked social inequality, coercive forms of government and Church authority, urging freedom from hatreds and a purer life dictated by one’s own moral conscience. These radical views led to his excommunication from the Church in 1901. After Tolstoy fervently embraced the works of Henry George, he put a number of Georgist proposals to the czar which, had Tolstoy been successful, may well have averted the Russian Revolution and changed the course of world history. 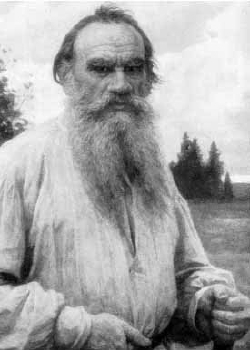 Count Tolstoy came to live out his convictions in a rather ascetic old age, to the point of condemning as worthless everything sophisticated, stylised and detailed – even his own great novels. He handed over his fortune to his wife and lived poorly as a peasant under her roof. Domestic quarrels made him secretly leave home one night, after which he caught a chill and died in a humble railway siding. There can be few greater tributes to this consummate master of the psychological novel than the fact that Mahatma Gandhi, who had admired Tolstoy for his expression of love for all human beings and had corresponded with him, went on to adopt Tolstoy’s nonresistance to the forces of evil.